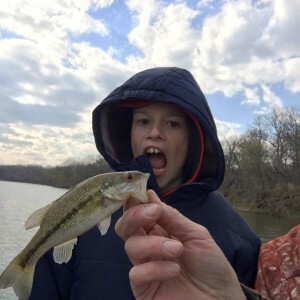 Our afternoon trip on Keystone Lake in Oklahoma was Jesse and family from New Mexico, and the goal of the trip was to get their little guy his first fish and hooked on fishing. Goal accomplished!!! 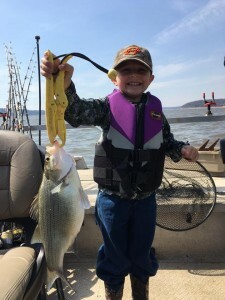 We found a few fish on a hump first thing and got a few in the boat with the little guy going crazy reeling in magnum white bass!!! They scattered and we went for a boat ride looking for more fish and having fun looking at the wildlife. A very large group of birds were on the water and took off when they saw us coming. He thought that was awesome to watch as they all flew off. 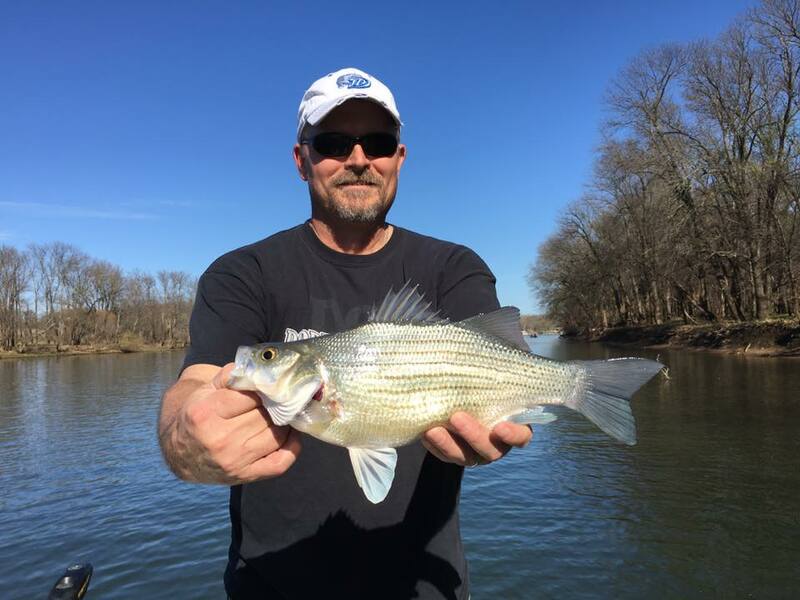 We found our way back to almost the same area and found a large school of white bass in feed mode. Game on until they were ready to head in to go eat supper and get the little guy down for the evening. Great trip with great customers from New Mexico. Thanks for letting us be apart of such a fun memory for your family! 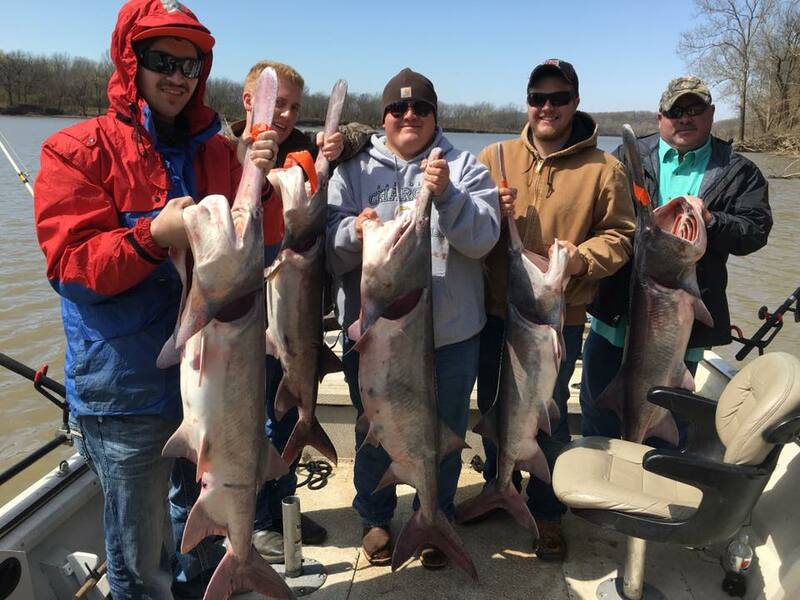 Today, we had new customers, Wayne and his buddies, for a teaching trip for blue catfish on Keystone Lake in Oklahoma. We started out going over the ins and outs of catching fresh gizzard shad consistently and how to throw a net. It took a while to get the size and amount we needed. The big bait was a little elusive until we figured out where they were hiding. We covered anchoring mid-depth, shallow water fishing, sonar reading, talked lots about techniques, rigs, and patterns. We finished up the day dragging baits on a deeper ridge. The fishing was a little slow, but our focus was on learning and we put some fish in the boat for them a dinner. 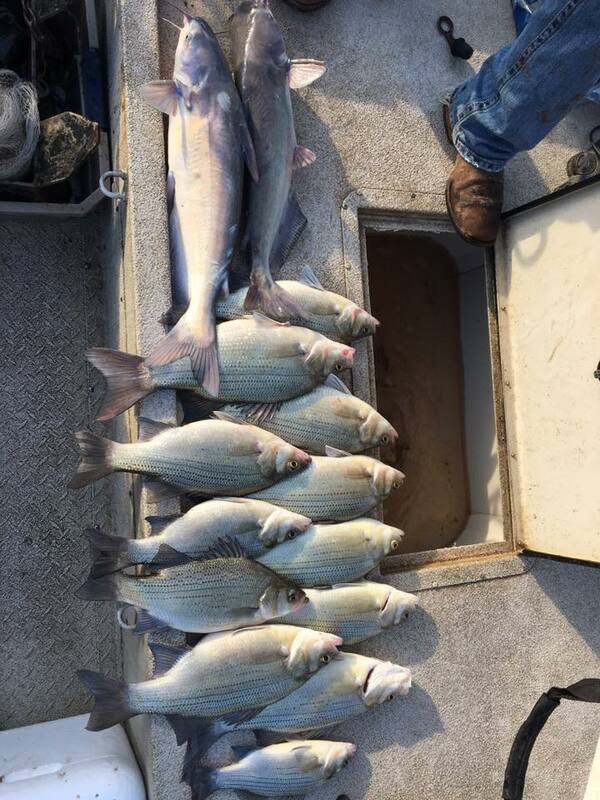 This morning we had a white bass trip on Grand Lake. We had a very large cold front come through and man it was cold this morning on the river. We all about froze and the catching was not happening. We got a couple, but definitely not what we were after. 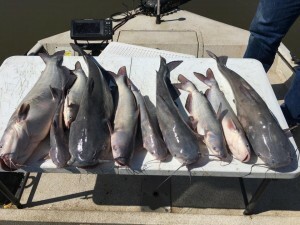 So, we called an audible…made a coffee and snack run on the way to a different area of the lake to blue catfish. A quick couple throws of the cast net and we had plenty of big gizzard shad. We went to see if the shallow bite was good. After only a couple of fish in about 30 minutes, we decided to go looking in the same area only a little deeper. We found some good fish just off the second drop out of the shallow area. Anchored up and bam, the blue catfish rod slam!!! We stayed there catching fish until the very strong wind switched direction and knocked us off out anchor. Instead of anchoring, we decided to drag baits down the channel. We caught a couple more and missed one huge takedown that just didn’t get the bait all the way in it’s mouth leaving the big blue skid marks on the bait. We finished the day anchored fishing a deep bluff edge. 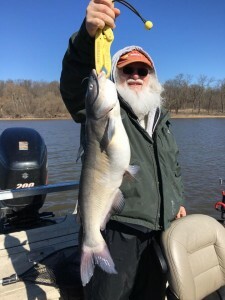 The blues were on the outside edge of the drop and the channel catfish were on the bluff side. We headed up to Twin Bridges on Grand Lake to meet up with Greg and his kids for an afternoon/evening trip fishing for white bass up the Spring River. A cold front blew in the night before and was certainly cooling things off, as well as, the fishing. 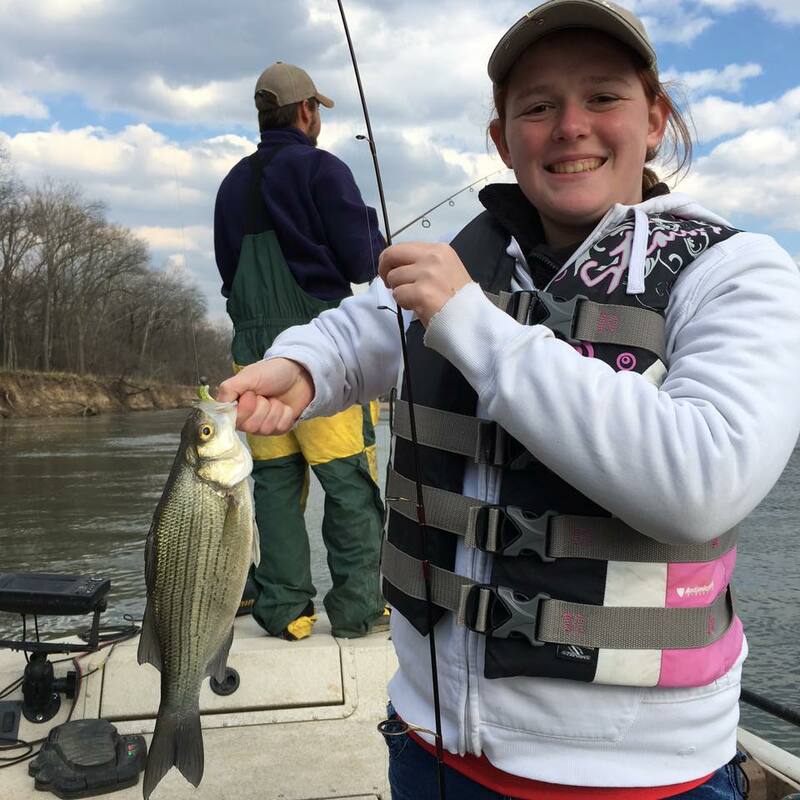 We threw GoGo Minnows and pulled off a very fun trip despite the white bass being finicky. We caught some really good white bass, but the action just wasn’t what it has been in recent weeks. They also managed to accidentally snag a spoonbill paddlefish that screamed the line off the reel and ran into a brush pile breaking the line immediately. We had a great time and made the most out of a chilly evening on the Spring River above Grand Lake. 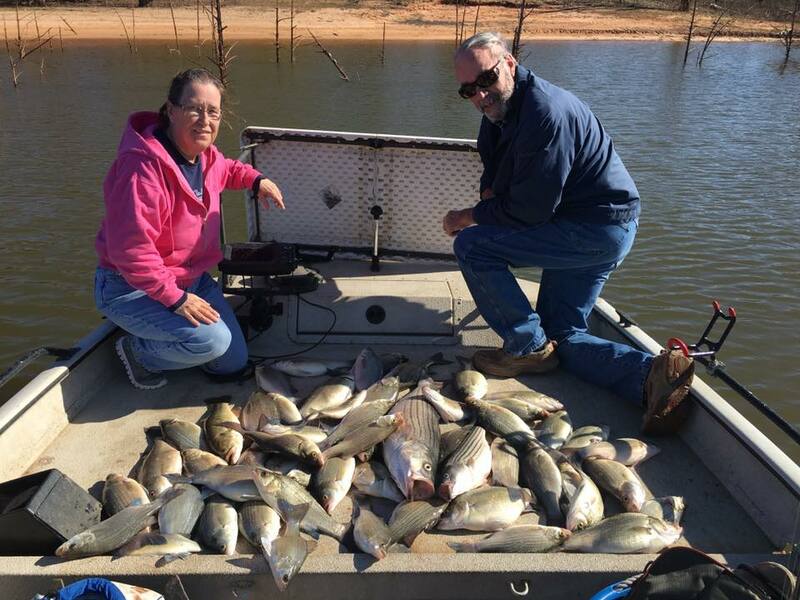 Our good friends and customers, Larry and Iris, love shallow water catfishing on Grand lake, so that’s what we did today. 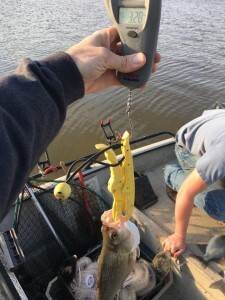 A few quick throws of the cast net and we had plenty of fresh gizzard shad in the bait well for the morning catfishing. Today, we wanted to try a new area we haven’t fished and see if we could get on a solid shallow water bite. The fish have been scattered with our mild winter and weird weather spring. We used our Lowrance side image to find bait and it continued to from deep water up to a good looking shallow area. The sun was up and bright, which warms the dark mud in some shallow areas. We found the fish we wanted to see in a small ditch in 1-3.5ft of water and got anchored up. 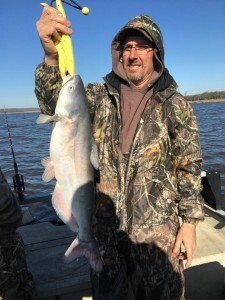 Our bite started out with channel catfish and then the blue catfish found our baits also. It wasn’t fast and furious, but it was a good consistent bite all morning allowing just enough time for good conversation with friends. Always a blessing to have these two on the boat. We met our customers for a teaching trip this morning on Oologah Lake for blue catfish. We quickly caught plenty of good bait in a few throws and were off to learn a little and catch a few. The weather folks said light wind today, so we wanted to put a few fish in the boat during the sunrise bite and then focus more on learning after that. We scanned a large area using the Lowrance HDS 12 side scan in water depths from 2-12ft deep and found our best school on a small ditch 6-8ft deep. It didn’t take long to start putting eating size fish in the boat(under 30inches). We had seen a few larger fish and put a few big fish baits out…just in case one wanted some breakfast. About 30 minutes into the trip one of the big fish baited rods slammed down and immediately started peeling drag. 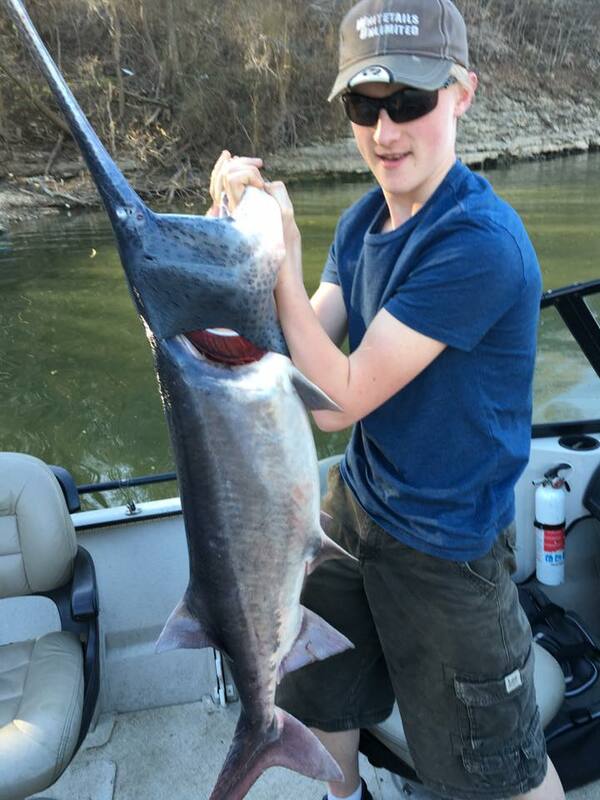 A customer, name won’t be mentioned, picked up the rod and held on as the drag screamed, however it suddenly doubled back and wrapped the line around a stump and the line snapped like a hot knife going through butter. We did get to see the fish come up on top for just a brief moment as it doubled back to see that it truly was a trophy caliber fish. Old Mr. Blue catfish won that battle. The bite slowed and slowed some more as the wind completely stopped. The rest of the day we focused on techniques, sonar reading, boat control, methods, patterns ect. Oh, and we did go help a friend that was high centered on a stump. Good times with good people enjoying a beautiful morning on Oologah Lake. We had the pleasure of having Lewis and Linda Hubbel on Keystone Lake to catch Striper and White Bass. Bait was tough this morning throwing the 8ft taped net in 40-55ft of water. I was only getting a few baits each throw and it took a good hour and a half to get enough baits for the day. We picked them up on the dock at 8:30 with a tank full of fresh and feisty shad. Long story short, we fished until 2:00 with only a largemouth bass and 3 white bass to show for our efforts. At 2:00pm, Lewis asked me at what point you just lick your wounds and give a win to the fish for the day. I told him I don’t give up that easily and planned on checking two more spots. I gave him the option of dropping them off at the dock and I’d go check them or they could join me. Luckily, he decided to stick it out and join me. First of the last two spots showed more fish, but still not active feeding fish…same thing we have been seeing all day long!!!! Last area to look, BAM exactly what we wanted to see all day long…FINALLY!!!! We hammered the white bass and a couple striper over the next hour or so. 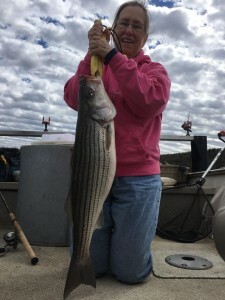 Linda got her personal best 13 pound striper!!! Congrats Linda!!! Thank you Lewis and Linda for sticking it through the long boat rides and slow moments this morning and allowing us to finally find what we were looking for. It’s the tough days of hunting the right group of fish that really make you appreciate good customers and looking forward to the days the fish cooperate a little easier. After our morning trip, we headed over to Grand Lake in Oklahoma to catch white bass / sand bass with Rich and his son. We were tossing the GoGo Minnow in the Spring River above Grand Lake slow rolling it along the bottom. 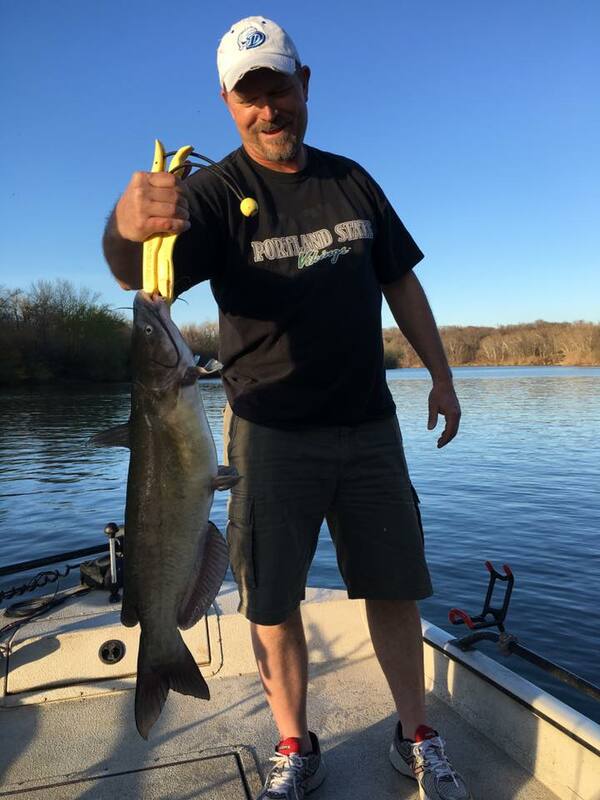 We had the mixed bag evening for sure…white bass, gar, spoonbill paddlefish, drum, and channel catfish. Much to our surprise, the channel catfish, was the meanest of them all. That fish peeled the drag and gave Rich a great workout on the light action rod! I got about half of it on video and that was over 3 minutes long. These guys were great to have on the boat on their vacation. I look forward to fishing with you guys again in the future.